Am I missing a piece to the lid? Probably not! There are only two pieces to the lid, the part that screws onto the jar, and a lid that goes on top after you fill it in with water. There is also a ceramic weight included. The picture on the box shows the water as a circular disk, so that might be what you're seeing. Hi! 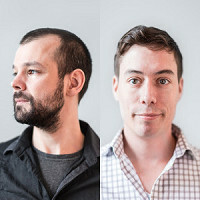 We’re excited to introduce Mortier Pilon to the folks of Grommet. I’ll be here answering your questions about fermentation, probiotics, and canning with our sets. Thanks! Hi everyone! Sophie with Mortier Pilon here. Our Fermentation Crocks boast durable materials and a sleek, modern look. Most importantly, they are designed to provide a safe, anaerobic environment for all your fermenting needs. We couldn't be more excited to launch them on The Grommet today! If you have any questions, ask away! What's the size of the crock? Are there directions included or would I need to buy the cookbook? Hello, the video references a weight, but the description of the product does not include a weight. Does one come with it? @Sophie can you make kombucha with it? @Sophie I'd like to learn more about the material? are the plastic? @Judith Thanks for the question! The crock has a 2-L capacity. The are two options as far as size goes: 2 L (67 fl. oz) and 5 L (169 fl. oz). 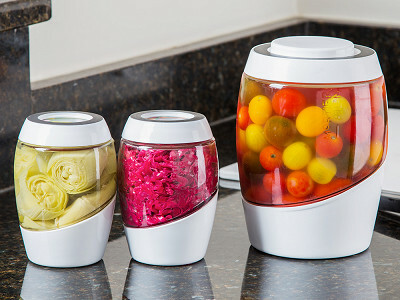 Either can be selected from the product page: https://www.thegrommet.com/mortier-pilon-home-fermentation-crock. I hope this helps! @Judith Oops! I left out the second part of your question. My bad! The crock does come with a booklet which includes tips & tricks and a few recipes. For more recipes, the cookbook is another great option! @GUEST Yes, the fermentation crock does come with a weight! Sorry that's not included in the product description, and thanks for pointing it out--we'll make sure to fix it shortly. @Joanne Hi! The crocks themselves are made of durable, heavy-weight glass. The white parts are plastic. Thanks for the question! @Andrea These are unfortunately not designed for kombucha brewing. 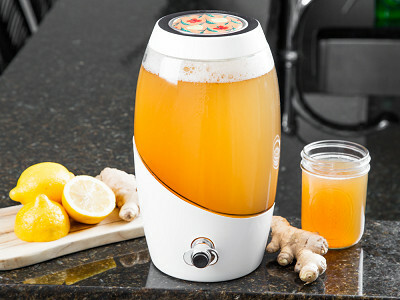 There is a Mortier Pilon Kombucha Brewing Jar (complete with a tap system for continuous brewing! ), however The Grommet does not carry it at the moment. Please do feel free to drop them a line via their email form if you'd like them to start carrying it here. Can you make Kombucha with this? Hi Gail, these models do not, but we will work on getting the brewing jar on site with enough interest. Two thumbs up on the Kombucha jar! On second thought, we have one here on site! Has Mortier Pilon tried out recipes that include grapes and sugar, for a different kind of fermentation? @JClaire Hi! The Fermentation Crocks were not designed with wine-making/alcoholic fermentation in mind, if that's what you mean--though that's definitely an interesting idea for the future! Hi there, these look lovely. Pls, does the food come in contact with any plastic part or does the glass completely contain the food? And, of what material are the weights made? @e The glass completely contains the food. As for the weight, it's made out of ceramic. @Guest Hi! All Mortier Pilon products are lead-free and BPA-free. All design (industrial and graphic) is done either in-house or with a local design firm (we are based out of Montreal, Canada). The actual production of the crocks takes place with a trusted manufacturer in China. Could I use this for sourdough starter? @Karen Great question! Let me double-check and I'll get right back to you. @Karen Okay, great news: the answer is a resounding yes! I vote for a kombucha jar too! These look awesome! It's been added to the ballot, Susan, thank you! Susan, stupidly I forgot we have a kombucha making kit here on site. If you do the fermentation process, do you have to have to also do the canning process to store in the smaller containers? @Irla Hi! 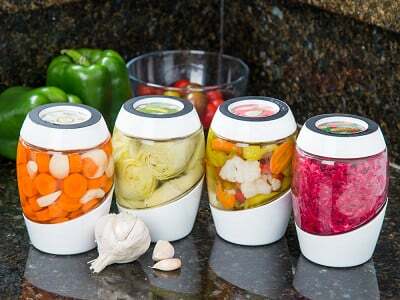 The Canning Jars are great for storing your pickles, sauerkraut, kimchi, etc. once the fermentation process is completed, bu they are not mandatory. Thanks for the Q! Do you offer the Mortier Pilon in a smaller size for a family of 2? How long will fermented foods last? @Linda Hi! The smallest format available is the 2 L (67 fl. oz) one. When it comes to the shelf-life of fermented foods, the key phrase is: it depends. 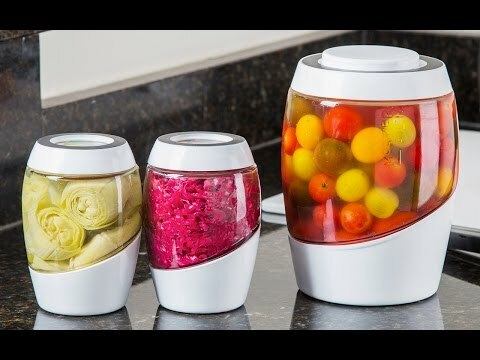 As a general rule, I would say that a batch of sauerkraut, kimchi or pickles made using specialized equipment such as this should last you at least six months in the fridge, and up to a year--though with a 2-L crock, it's more than likely you'll have eaten it all before that long a time has passed! 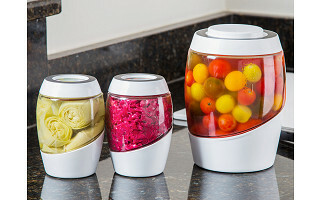 Still, if you're worried about tasty fermented goods going to waste for lack of eating, there's another option: once you think your kraut or pickles have fermented long enough and you're happy with the taste, you can can some of it using the Mortier Pilon Home Canning Kit: https://www.thegrommet.com/mortier-pilon-home-canning-set. I like to make refrigerator pickles because of the crispy, crunchy results. How do the pickles come out with this process? Crispy or traditionally a bit squishy? @Kathleen Good question! As a general rule, the longer you ferment your pickles for--whether in the fridge or on the countertop--, the softer they'll get. For crunchy fermented pickles, definitely don't let the fermenting process go on for more than 3-4 days. I definitely recommend you give this kind of fermentation a try--it brings a more complex, deliciously tangy kick to your pickles while boosting their nutritional value! I am also interested in the Kombucha option too. I would really like one to start wine making. @Guest Hi there! If you're looking to make wine, the Mortier Pilon Fermentation Crocks currently sold by The Grommet are actually a better bet than the Kombucha Brewing Jar, as wine-making requires a water barrier of sorts to prevent the wine from oxidizing. The Fermentation Crock allows this, but not the Kombucha Brewing Jar. Please note however, none of the Mortier Pilon products were designed primarily with wine-making in mind; it doesn't mean it can't be done, but it's not their primary purpose. Happy fermenting! Hi there, we do have a Kombucha making kit here on site if you'd like to check it out here! If I am making pickled onions or pickles, does the container go in the fridge or stay on the counter? @Nancy On the counter or in a cupboard until you think it's fermented long enough (which can vary a lot depending on the recipe) and you're happy with the taste; then, you can store the pickles in the fridge as is or transfer them to the smaller Mortier Pilon Canning Jars (also carried by The Grommet). Does the jar have to be filled (to capacity) when you start, or can you ferment / pickle items that only fill half the jar? So it a problem being half filled with veggies and half air? Or do you need to fill to the very top with liquid then? Even the smaller 2 L size might be a lot for just one person....thanks! @Valerie Hi! We typically recommend filling the crock up to a couple inches from the top to prevent bacteria from developing inside the crock, but if you'd like to start with a small batch, a good tip is to cover the contents of the crock with a cabbage leaf before you start fermenting; that way, any bacteria that might develop in the headspace won't come into contact with your kraut, pickles or other. As a general rule though, I would say that a batch of sauerkraut, kimchi or pickles made using specialized equipment such as this should last you at least six months in the fridge, and up to a year--and with a 2-L crock, it's more than likely you'll have eaten it all before that long a time has passed! Are the pictures of the pickles in the crock of the 2L or 5L? Which is better for picklemaking? 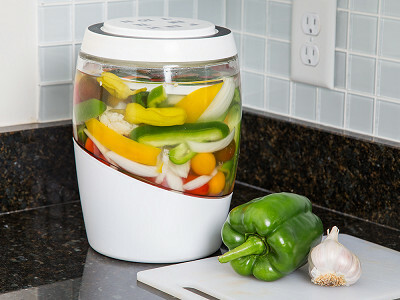 @pamela Both work great for all kinds of pickles (cucumber or other)! It just depends on how much you want to make at a time. On the video thumbnail at the top of this page, the crock with the cherry tomatoes is the 5-L; the other two are 2-L.
@pamela Oops--my bad. The small jars on the video thumbnail are actually from the Mortier Pilon Canning Kit, which The Grommet also carries. Apologies for the mistake. The crock with the pickles on the product page is indeed the 2-L one. I saw a comment about being able to use this for sourdough! Yippee!! My question is can you use this for all the different types & styles of kimchi? @Patricia Hi! The answer to your question is yes! This works for all types and styles of kimchi. Speaking of which, our cookbook includes a lot of diverse, delicious kimchi recipes. Thanks for the Q! @Sophie Thanks so much Sophie! I make my own but I hate trying to find the right container for fermenting and the ones I bought that are for fermenting my daughter has confiscated and I won't see her for months she is in school. But this looks cool! I may get one for my friends husband since he is all into Oktoberfest and he is taking a class next month that will teach him how to make his own sauerkraut! @Patricia It's awesome that you're passing on the family tradition of fermenting your own food! Happy fermenting, and thanks for the kind words! @Sophie One more quick question....the recipe booklet that comes with the fermenting kit is it different from the recipe book I saw being sold separately? @Patricia Yes! The cookbook contains loads of information on fermentation, tips * tricks, and 40 recipes (mostly fermentation ones, plus a chapter on canning); the booklet features only five of those recipes, plus instructions on how to use the crock. @Sophie I went to the order form...it only offers the 5L. What's up? Hi Cindy, it appears the 2L crock is sold out. We will work to get it back on site as soon as possible. Hi, I'm concerned about the smell of fermentation going on in my apartment and how that may affect intolerant family members. Any pointers? Do you not have the 2L available right now? It's not an option to purchase for $39? Not at the moment, David. We are working to get it back in stock now! Then canning set is very pretty, but I have a question about the lids: I doubt they are reusable -- can you also use the widely available Ball lids I can purchase anywhere or do your jars and rings require your proprietary lids? Hi Heidi, the lids for the canning jars are actually dishwasher safe so you should get plenty of mileage out of them. As for the lids, Ball lids will unfortunately not fit the Mortier Pilon jars.